Do I Really Need a Down Payment When I Purchase a Home? Traditionally, you need to have a down payment of between 10 and 20 percent of your home costs saved up before you purchase a home. Mortgage lenders did this to protect themselves, because it indicated that you would be more responsible with their money. It also protected them, because they did not loan out the full value of your home, and if you were to default on the loan, they were more likely to make full recovery from the loss. However, in recent years things have changed. 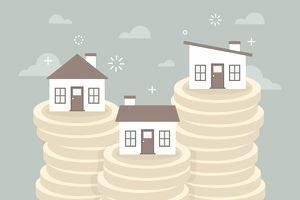 Many people would take out two loans in order to avoid the cost of private mortgage insurance (PMI) and still not have a down payment on their home. Some banks also offer 100 percent financing for a home. Other couples may qualify for an FHA loan, which eliminates the need for a large down payment. Banks also offer mortgages with easier qualifications, but this might not be the best option. It's better to save up a down payment for your home if possible. There are several reasons that this is a better approach to buying a home. One reason is that it proves that you are financially ready and responsible enough to buy a home. When you purchase a home, you are responsible for all of the maintenance costs related to the home. You will need to pay for repairs and homeowners insurance. Saving up for a down payment proves to yourself and the bank that you are in a position to make those sacrifices. In many cases, your mortgage will be higher than the rent you're paying, so it demonstrates to yourself that you are ready to be responsible financially. Another reason to have a down payment is that it protects you in case you need to move, and the housing market has dropped. Many people can't sell their homes because they bought the home without a down payment when housing prices were at their peak, and now they owe more than their home is worth. There is no pretty way out of this situation. Either you will lose lots of money or you will ruin your credit, or you will do both. So many people are hanging onto their homes hoping that the situation will improve. Using a down payment does not completely prevent this from happening to you, but unless your home value falls more than 20 percent, you are in a much better situation. Making a down payment on a home helps avoid any regret of buying your home. In addition to showing that you are financially prepared to purchase a home, saving up for a down payment will allow you to purchase a home that you will like and you will not regret buying. The down payment can increase the size of home you can afford, and it can help you a home in a better location. Essentially, it gives you more choices because you will still qualify for the same amount on your mortgage, the down payment is additional money that can increase your purchasing power. When mortgage rates are low, you may be feeling the pressure to purchase now, so that you can save money in interest over the life of your loan. It is true that you may save money, but you cannot see the future. You do not know if the house prices are going to rise or if they take a fall again. You do not know if you will need to move suddenly due to a new job or a transfer, and then you will need to sell, but you may not be able to because of how much you owe on the home. Your down payment is some extra padding between you and the unknown. When you do decide you are ready to purchase a home, you need to make sure that you choose the best mortgage with a fixed interest rate. An adjustable rate mortgage will cause your mortgage payments to go up as the interest rate increases. You should have a good home inspection done before you close. Additionally, you will need to get home owner’s insurance. Finally, begin saving money for home repairs. You will need money set aside for money plumbing fixes and major repairs. Making this a part of your monthly budget will make managing your finances much easier. What Happens If I Can't Pay My Mortgage Payments? What Is the Best Type of Mortgage to Get? Wanting to do home repairs? Is a home equity loan a good idea? What Expenses Should I Cover with a Sinking Fund? Are Your House Payments Making It Difficult to Cover Your Other Bills? The Average Price of a Starter Home Across the U.S.